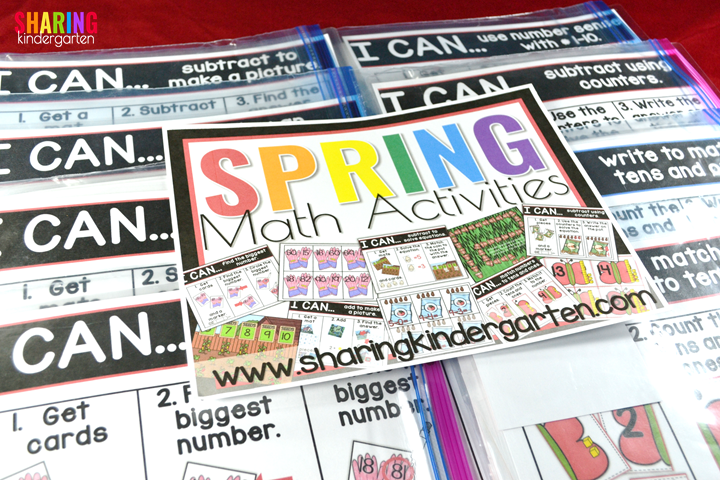 Spring Into Math Fun with Spring Themed Math Activities by reviewing all those math skills on a regular basis. 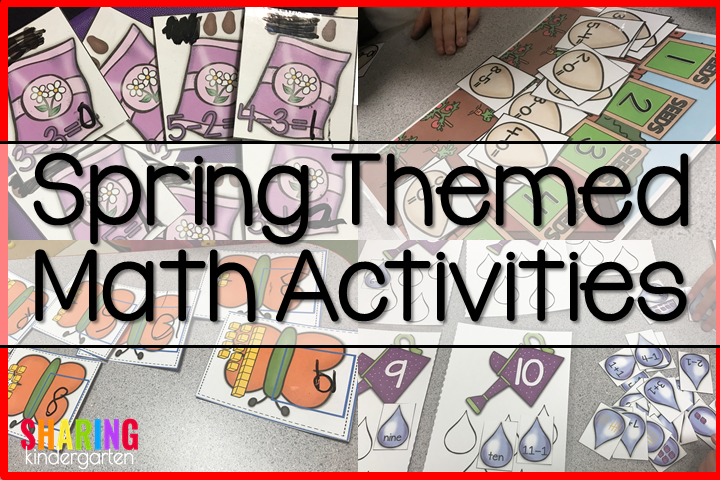 It is just smart to keep activities reviewing of all those important skills, even as you are building on new skills while we Spring into Math Fun! 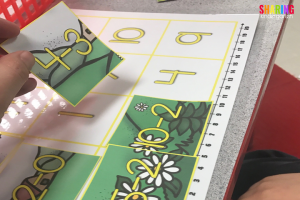 Check out these hands on Spring Themed Math Activities. 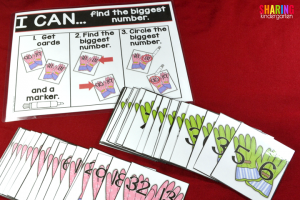 First, look at this one activity to help our learners find the biggest number. 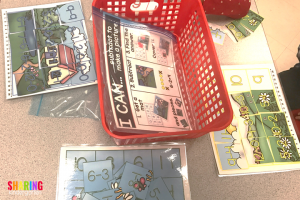 There is an I Can statement along with two color coded versions to play. 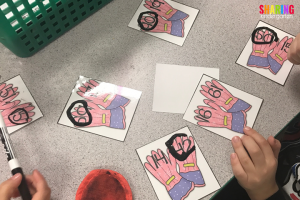 Students circle the biggest number on the gloves. 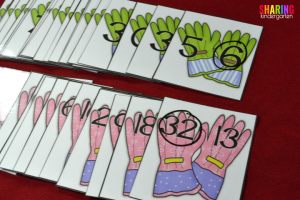 The green garden gloves work with numbers 0-10. The harder set uses the pink gloves. 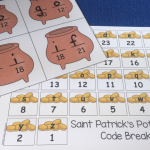 I like to use this set to work with tricky numbers like 32 and 13. If the students are confusing 13 and 31, this problem becomes slightly more challenging in a good way! Here are my students using the harder set to find the biggest numbers. 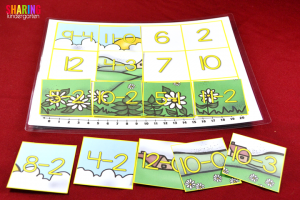 Next, take a glimpse at another game which is for sorting using subtraction. 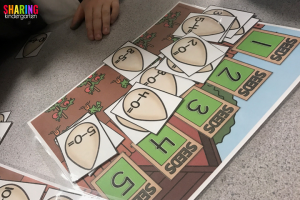 Students use the mats to hold their answers and they use the seeds with the problems to answer. 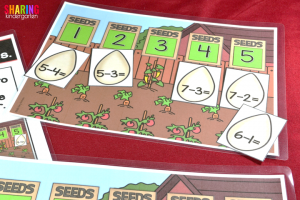 they can put seed on the seed package on the mat. Here we are sorting away! 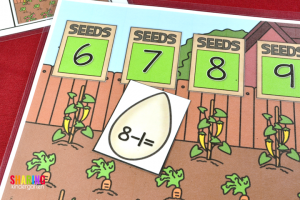 We took the pile of seed equations and divided them up between the number of players. 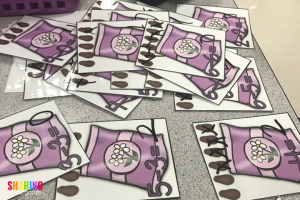 Then the sorting and learning begins! 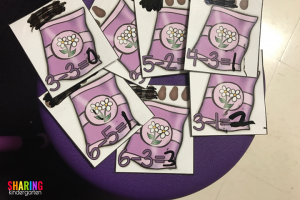 I encouraged my students to place their seeds just below the number on the mat. 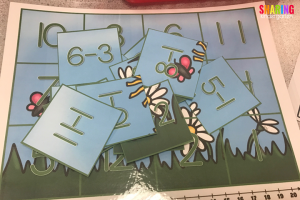 Another spring themed activity my students LOVES to use is this game to work on subtraction with counters. 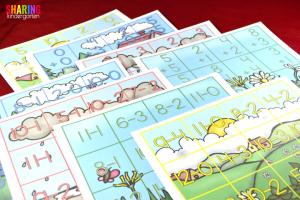 There are three matching versions of this game, all which are the exact same, but with different images. 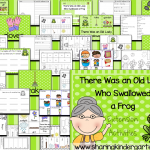 This makes it easy for center activities because each learner can have their own version. 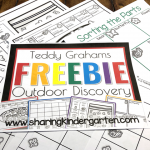 You can check out the table set up. We leave the I Can statement in the basket. 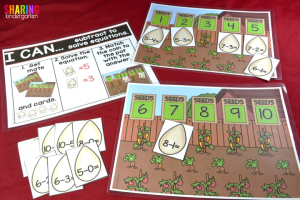 Then each student at the table gets their own seed pack subtraction activities. 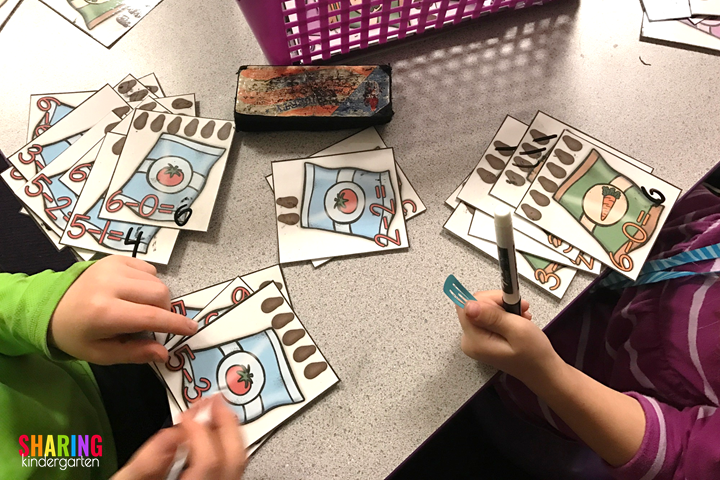 Check out these in the classroom action shots! 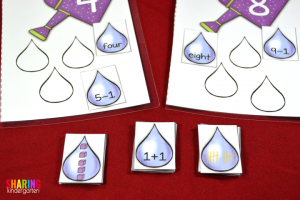 Additionally, here is a number sense game! 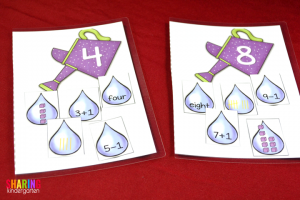 Use these watering can mats for numbers 1-10 and choose from 8 different types of number sense water drops to create the ideal game for your classroom needs. 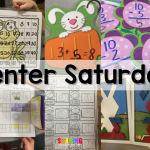 I chose to use addition, subtraction, number words, tally marks, and base ten blocks for my mats. Here is a glimpse of the mats when they are sorted to completion. 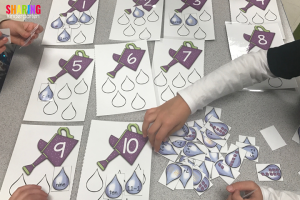 Here are some action shots from my class with my students sorting their water drops into the watering can mats. 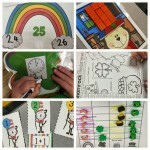 A class favorite are these self checking, differentiated addition and subtraction puzzles. 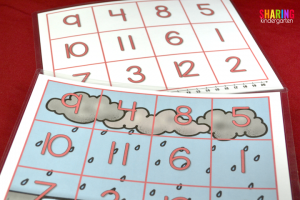 There are two different types of mats which are the SAME for both the addition version and the subtraction version. The plain one is harder while the picture rich version is easier. 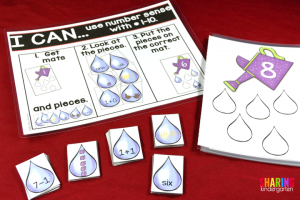 There are both vertical and horizontal equations for each game and all the pieces are color coded. 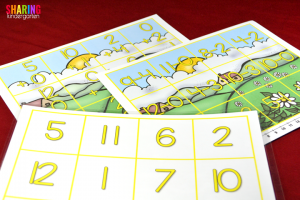 Next, look at the mat on the bottom (which I print back to back) and the addition and subtraction problems. 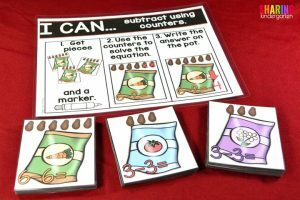 Could you mix and match these to make an even more fun mixed addition and subtraction game? YES. 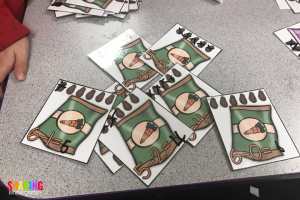 As your students answer the equation, they place that number on the mat to show the answer, and a picture is created! Here is this center set up with the I Can statement in the middle with each color coded practice mats on each spot. 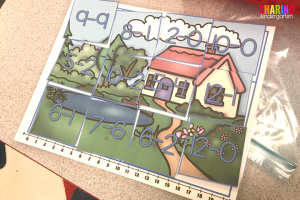 Here is the blue mat… as you can see we are working on the subtraction version. 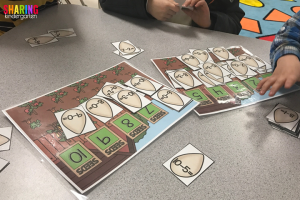 More so, once a student leaves their station, they scramble their pieces up so the next student has to start all over again. 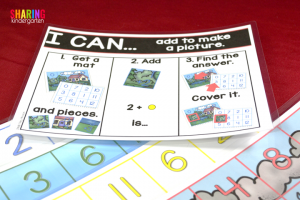 And again, the answer mat was printed on both sides so they student can choose which version they should work with. You can see one of my little loves working hard here. 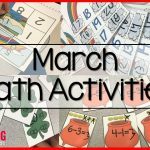 You can spring into math fun with all these math activities (and more!) 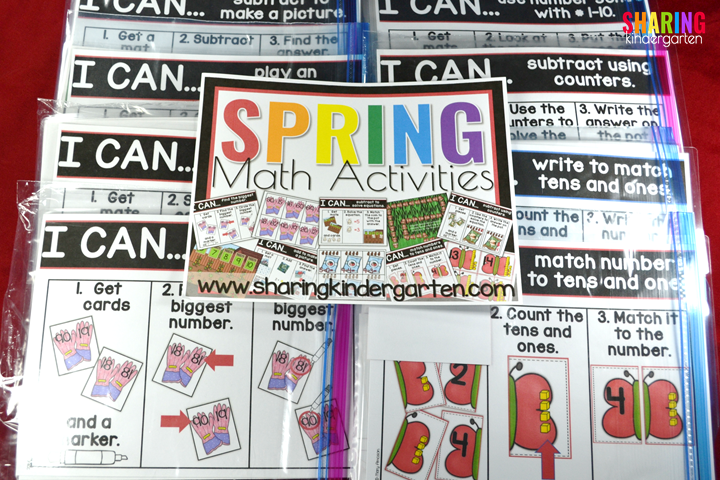 in this Spring Math Activities.